Friends of the Bedford Public Library, Inc.
Heron Valley are an energetic, young traditional band from Scotland who have serious enthusiasm for the music they play. Their roots lie in Scottish and Irish traditional music, while taking influence from various Folk, Country and Bluegrass styles. 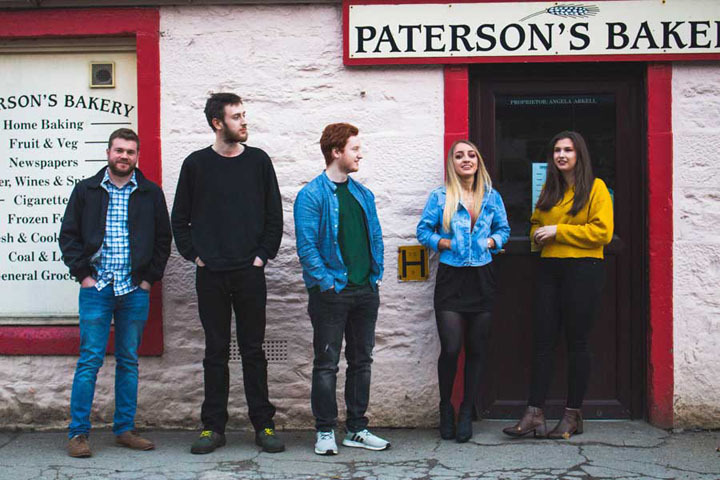 The five-piece, energy fuelled group comprises piper/guitarist/whistle player Euan McNab, banjo player/drummer Nick Hamilton, pianist Arlene Mackechnie, guitarist/vocalist Abigail Pryde and bassist Callum Cronin. Since their inception in 2014, Heron Valley have always ensured that they are conveying the highest amount of energy they have to every crowd they play to, ensuring that people who come to see them live have a fantastic experience. In 2015, they set themselves the challenge of releasing a music video and a debut single, to allow people to clearly see their intentions. This began with their set of tunes, Pressed for Time, and their original idea of filming out on open water on a yacht. The storyline took the band from performing out on this moving boat, to their journey to and performance at a gig. The idea of this was to convey to their audience the enjoyment people have when they come to see them live. This was extremely well received and racked up 85K views, with people all over the world purchasing the single. A year later, they released their second single ‘Home’ along with an extremely diverse music video. This time, they set off at 4AM to climb up Beinn an Lochainn, a hill in the west coast of Scotland. The video sees this journey from bottom to top and shows them playing on cliff edges in the area they all grew up. This gathered an incredible 173K views, and was shared over 2,000 times. Due to this success, Heron Valley then quickly made a massive impact on the folk scene in Scotland, and 2016 seen them on their tour of 11 Festival stages over the UK, while 2017 seen them on a tour of over 20 festivals around the UK and Europe. Johnny Walley at Folk Music Radio was ‘particularly impressed by the structure of their set, building up the energy incrementally in a series of waves, taking the audience along with them every step of the way.’ With the unbelievable reaction they received at these gigs, and the demand for more recordings of their music, Heron Valley released their debut album, Roam, in May 2017. This has been extremely well received by the public, and has been the focus of their gigs during their 2017 Summer tour. This features 8 brand new tracks of self-penned songs and lively sets of tunes. For more information, call 540-586-8911, or visit www.friendsofbedfordlibrary.org.